I'm pretty much an average gamer; my skin is pale, I have a gut you could use as an impromptu bongo, I would not be described as one of the beautiful people. 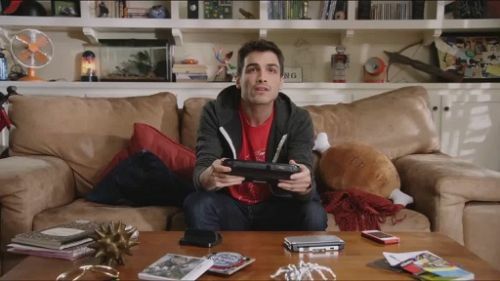 Therefore, I was never offered the chance to appear in the new Live Action trailer for the 4 player co-op Wii U/3DS crossover game Monster Hunter 3 Ultimate. Witness pretty people play the game, but also get an idea of how the cross platform functionality is going to work. Monster Hunter 3 is out in the US already, so I imagine that the better looking of you are already sitting around a park bench playing the game in 4 player co-op. If you are unsure whether the game is for you, the below trailer provides a useful, if cheesy, insight. The game is compatible with both the Wii U and 3DS and you can continue your progress from one format to the other. In the video our handsome hero starts playing on his Wii U at home, only to decide to meet up with his friends in the park for some 3DS action. Finally, they return to his flat for some cross platform play.